Closing night: July 31, 6-7:30pm: We close the festival with live music from Men in Grey Suits and pūpū from Mahina & Sun's—and a tribute to Hawai‘i’s North Shore big-wave surf pioneer Peter Cole. Drinks will be available for purchase. In the talk-story lineup on stage will be Clyde Aikau, Kohl Christensen, Mark Cunningham, Darrick Doerner, Kimo Hollinger, Randy Rarick, and Jock Sutherland. A short film on Peter Cole will be shown before the presentation of the feature film of the night, Surfing the Fifties, at 7:30pm. $25 | $20 museum members. The Honolulu Surf Film Festival pays tribute to Peter Cole, the bright, gracious, persevering big-wave surfer from the North Shore. The winner of the 1958 Makaha International contest, Cole was one of the original California-born surfers who helped shape big-wave riding in the late 1950s and early '60s. "He'd wait with the patience of Job for the biggest wave of the day," fellow California transplant Rick Grigg said. "And when it came he usually caught it." Cole was born in 1930 in Los Angeles, the son of a stockbroker, and raised in Highland Park and San Marino. He began surfing at age 14 when he moved with his family to Santa Monica. He graduated in 1953 with a B.A. in fine arts from Stanford University, where he played water polo and was a nationally ranked middle-distance freestyle swimmer. While at Stanford he often drove to nearby Santa Cruz to ride Steamer Lane, developing a taste for large waves. At six-foot-four, Cole was the tallest of the big-wave surfers, and perhaps the least nimble. But because of his tremendous swimming ability, along with an inborn calmness and an analytic mind that told him big-wave danger was overstated, he soon gained a reputation as one of the sport's boldest riders. In 1972, however, Cole was struck by his surfboard and blinded in his right eye. Cole received an M.S. in information sciences from the University of Hawai‘i in 1971. He had left Punahou School (where he'd taught Gerry Lopez and Jeff Hakman, among other well-known '70s surfers), and was then working as an operations research analyst for the Navy Civil Service. Decades passed, and Cole continued to ride big waves on the North Shore, attributing his longevity in part to the fact that he had a rich life outside of surfing. "Those of my generation who dedicated all their time to surfing aren't in the lineup anymore. For a surfer to ride into old age, it's important that surfing be nothing more than a recreational activity. It should never be a person's entire life." Although he won the 1958 Makaha International and rode in the 1965 Duke Kahanamoku Invitational, Cole generally took a dim view of surfing contests, saying that they worked against the main purpose of the sport, which is to have a good time. Cole rode Waimea for the last time in 1995 at age 65, but was still riding Sunset Beach—without a leash—into the mid 2000s. “When Peter paddles out at Sunset," Rick Grigg said in 1998, "everyone cheers." Cole appeared in a half-dozen surf movies including Surf Safari (1959), Barefoot Adventure (1960), and Cavalcade of Surf (1962). He was also featured in Surfing for Life, a 1999 PBS-aired documentary about aging surfers. 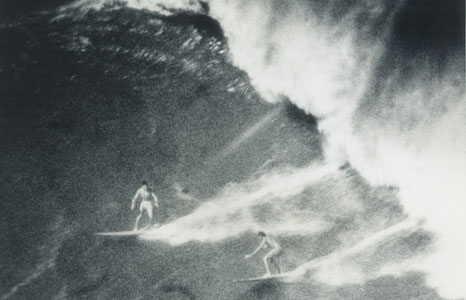 In the mid-60s, Cole wrote articles for Surf Guide magazine, mainly on big-wave riding. Cole was inducted into the Hawai‘i Waterman Hall of Fame in 2011.